Another member of the Vancouver Canucks’ stacked prospect pipeline is Tyler Madden of the Northeastern Huskies in the NCAA. Madden is a prospect who has been overshadowed by names like Quinn Hughes, Olli Juolevi and Michael DiPietro, among others, but his name has been surfacing more of late. With the 2019 IIHF World Junior Championships underway in Vancouver and Victoria, British Columbia, Canucks fans have had plenty of opportunity to watch Madden chalk up three goals and a helper in five contests for the United States. He has been one of their top players in the tournament so far. Tyler Madden named player of the game for USA. This kid winning over lots of #Canucks fans. 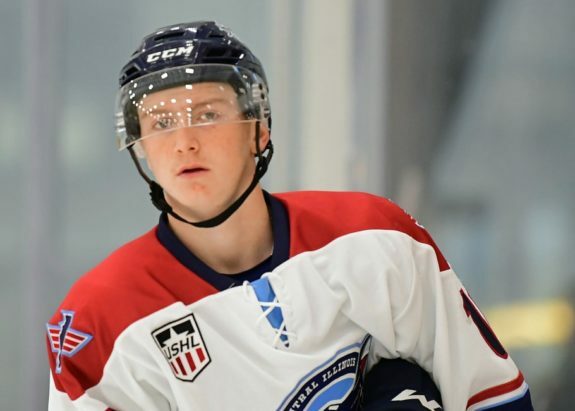 Madden was picked up by the Canucks in the third round (68th overall) of the 2018 NHL Entry Draft after a 34-point season split between the Central Illinois Flying Aces and the Tri-City Storm, both of the USHL. His small 5-foot-11, 152-pound frame undoubtedly kept him pretty low in scouts’ rankings, but his offensive potential is starting to grow larger than the doubts surrounding his stature. With 15 points in 14 games with the Huskies, the 19-year-old has emerged as a genuine offensive threat in a competitive league and put himself on a lot more radars. The United States made the easy decision to add Madden to their 2019 WJC roster and the Canucks are now confident that they made a steal in the third round. Because of Madden’s size, his jump into the big leagues will be a little bit more difficult than other prospects. He won’t be a 40-goal guy in the NHL or even the AHL, but that doesn’t mean he can’t be a valuable asset for the Canucks in the future. His speed and tenacity can make him a terrific two-way forward stationed on the third line or possibly the second if his offensive game continues to develop over the next few seasons. He models his game after his father, John, who played 13 NHL seasons as a pesky undersized forward. John Madden punched in for just under 900 NHL games, won the Stanley Cup three times and also took home a Frank J. Selke Trophy. So Tyler has some big shoes to fill. With that being said, the game has changed a lot since the 2000-01 season when John won the Selke, so Tyler’s elevated skill should be enough to keep him relevant in today’s league. Madden still has a long way to go before he will be NHL-ready, but the early signs of a solid NHL career are on display. His stellar play in the WJC, in front of the Canucks faithful, is not hurting his case at all. With the United States currently in the medal rounds of the tournament, it will be interesting to see if he can continue to rise to the occasion on the growing stage. These games are where the stars of tomorrow come to play. I think that the 2018-19 season was where we saw Madden make the leap into a potentially strong NHL forward. The season with the Huskies, and his great play in the WJC, have substantially bolstered his resume. The Canucks will be shipping a contract Madden’s way in the offseason, I’d imagine. All eyes will be on him as the United States progress through the back-nine of the WJC, but I think he will rise to the occasion and impress even further before the final whistle blows in Vancouver. His trajectory could possibly be quite similar to that of former Husky and current Utica Comet, Adam Gaudette’s. However, because of size, and also the depth the Canucks have at center, I would not be surprised if they look to transition him to the wing. Another skilled right-handed shot on the wing would not hurt the Canucks’ lineup. What do you think about Madden? Has his time at the WJC been enough to win you over? Let me know in the comments down below!